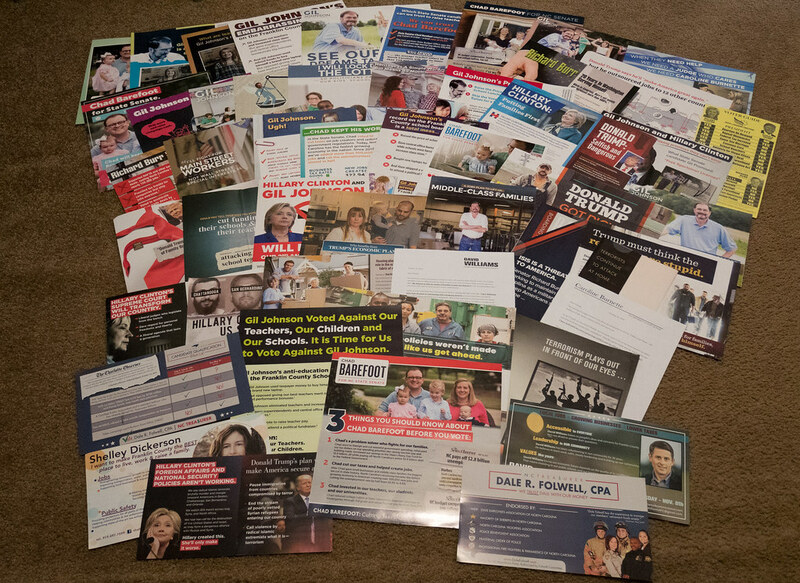 This year, I collected all the political ads that were in my mailbox. 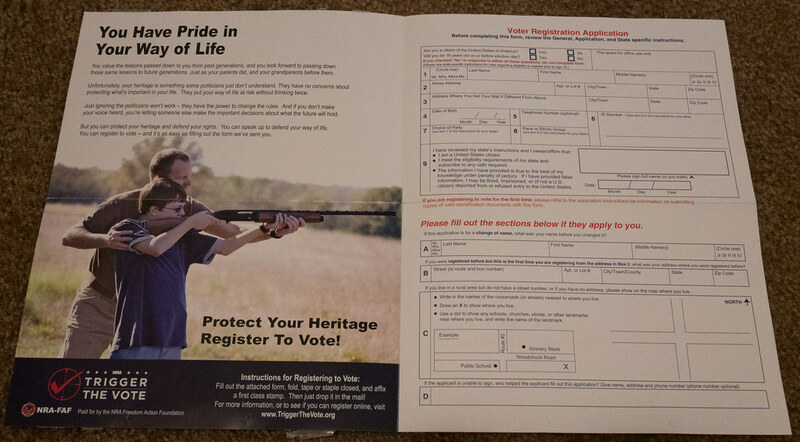 I live in North Carolina, and am registered Independent. 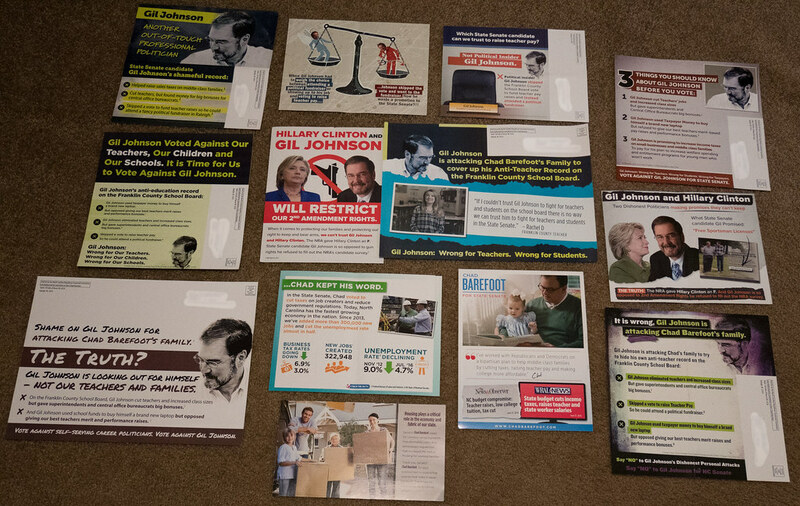 Check out my analysis of the numerous flyers in my mailbox this election season. 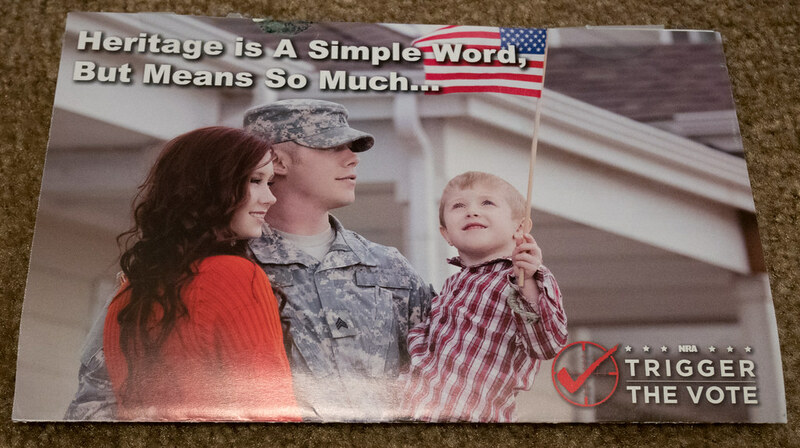 First up is an complete picture of all of the ads. Lets get into some more detail. 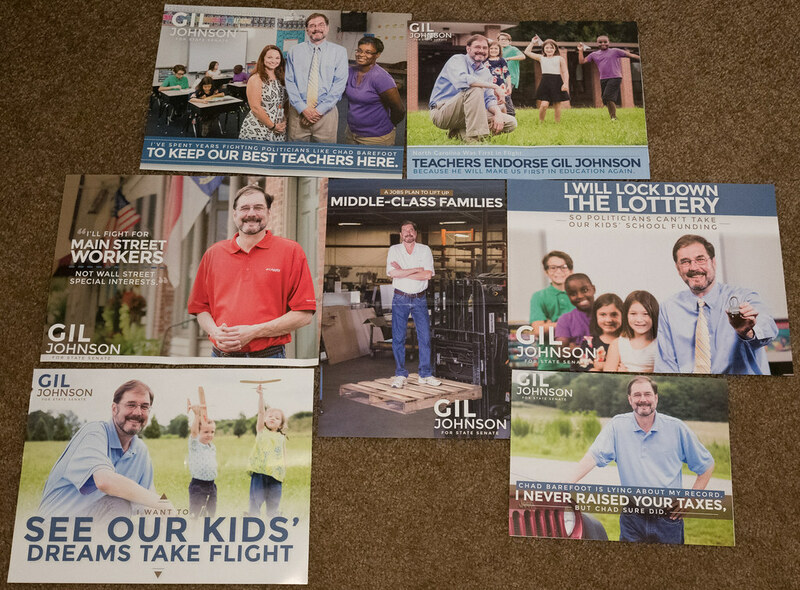 Flip them over to the backside and you can see some are more pro Gil wording, but some also throw in a section against his opponent Chad. 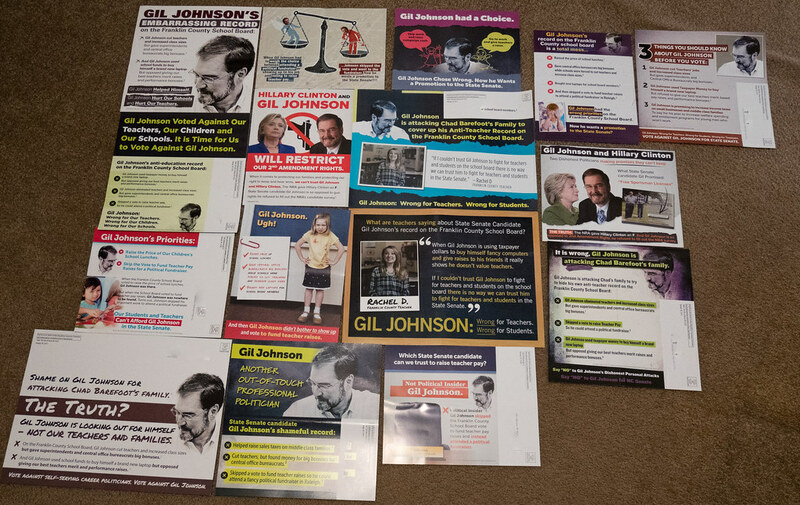 Now, lets check out the ads against Gil Johnson. Flip these over and you can see they feature more negatives about Gil, or positives for Chad. Let’s take a look at all the ones that have positives for Chad Barefoot. Flip these over and you’ll see a mixture of the negatives for Gil, and just a few that are all pro Chad. The next set is for the big race, Donald Trump versus Hillary Clinton. Here is the collection of them all combined. 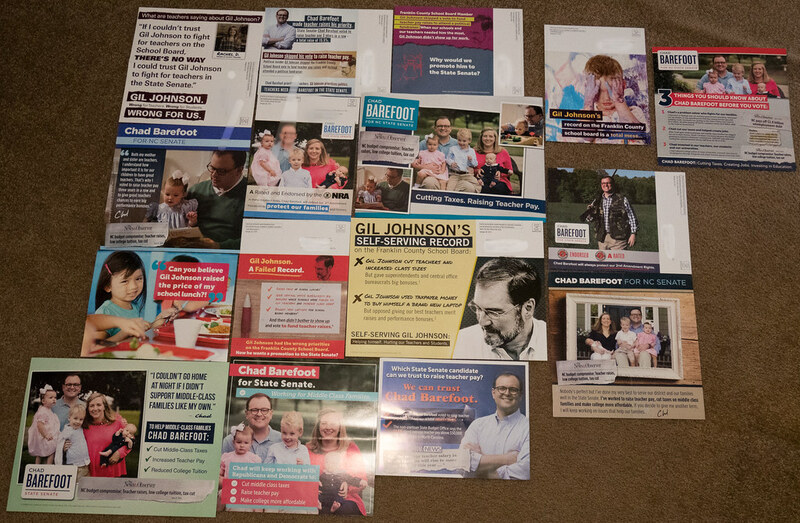 You would think this larger race would have sent more ads from both sides, but the count was less than the Gil vs Chad above. 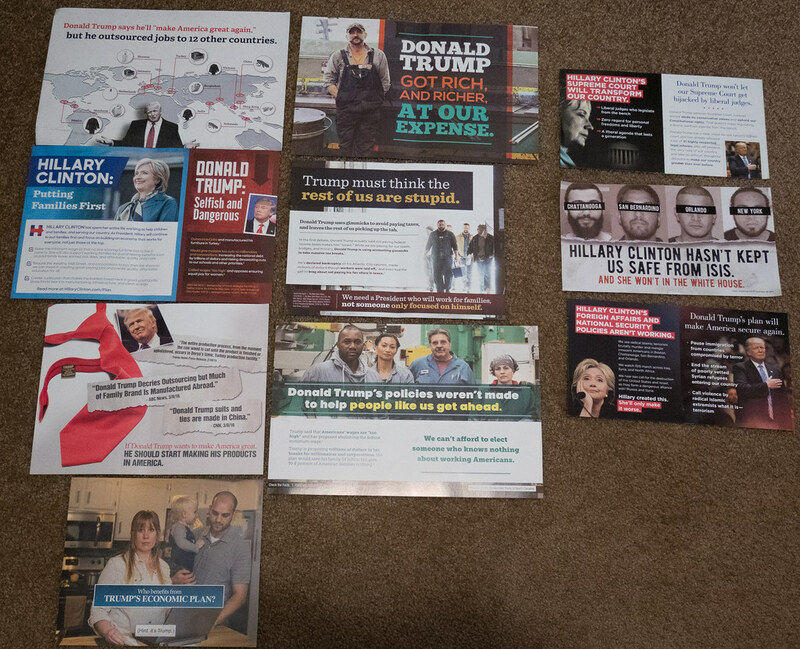 The ones on the left and middle column are against Trump, while the three on right hand column are against Hillary. Flip sides, they’re all still negative towards the other side, and none that are positive to any of them. 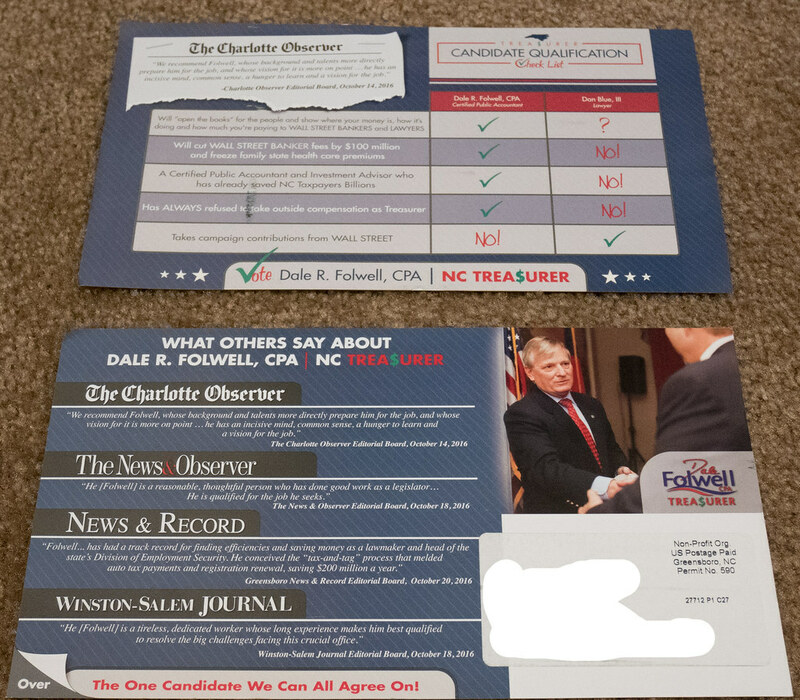 I received 2 ads regarding another local race, against Richard Burr versus Deborah Ross. 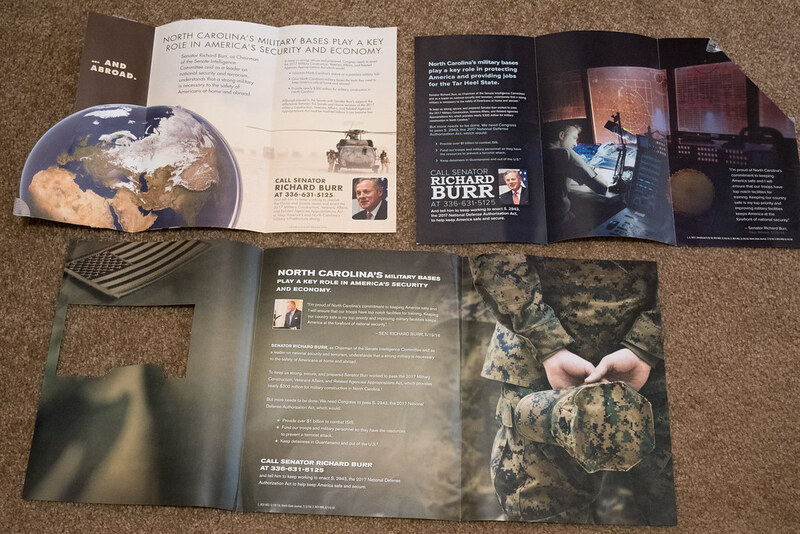 Of the 2 ads I received in this race, they both were against Richard Burr. 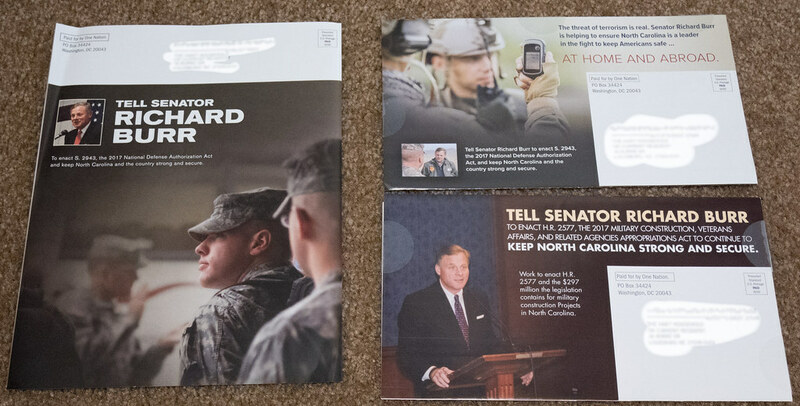 Flip these 2 over, and they’re still against Richard Burr. 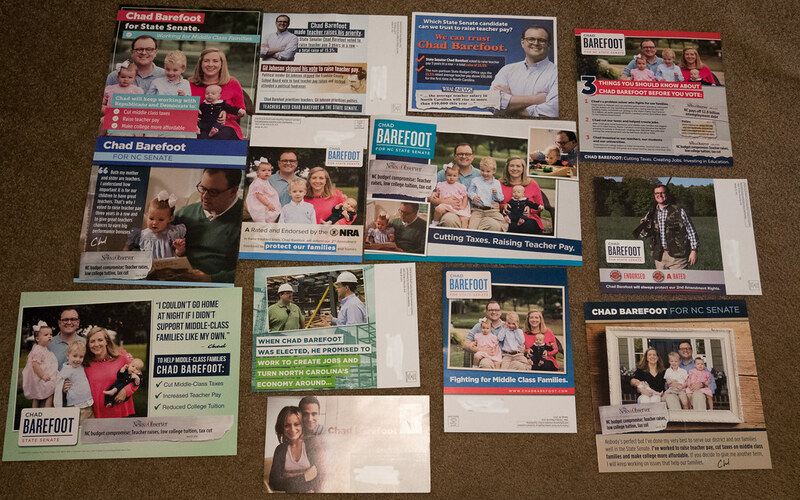 Note, none of the ads mention his opponent Deborah Ross. So there’s ads to tell you not to vote for Burr, but none give you the alternative candidate. I received 3 ads that weren’t about the election at all, but timed appropriately. These 3 ads warn of terrorist attacks. 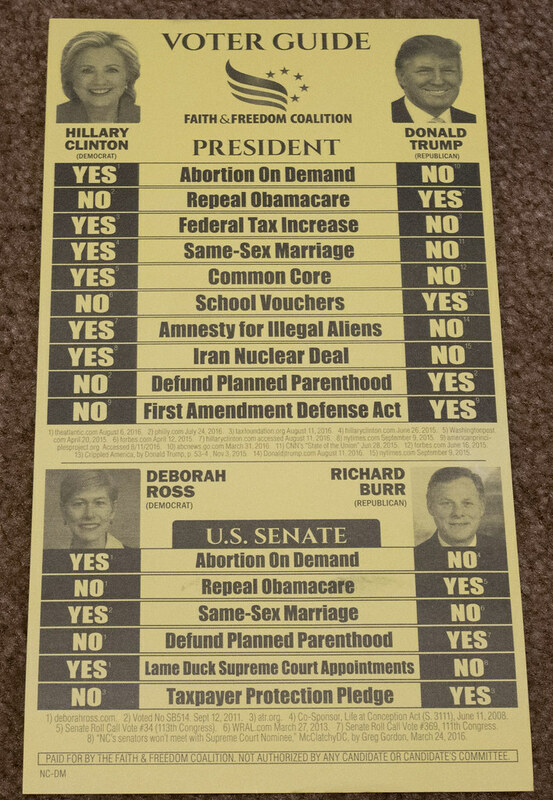 The back sides mention Richard Burr, but notice none are saying you should vote for or against him. 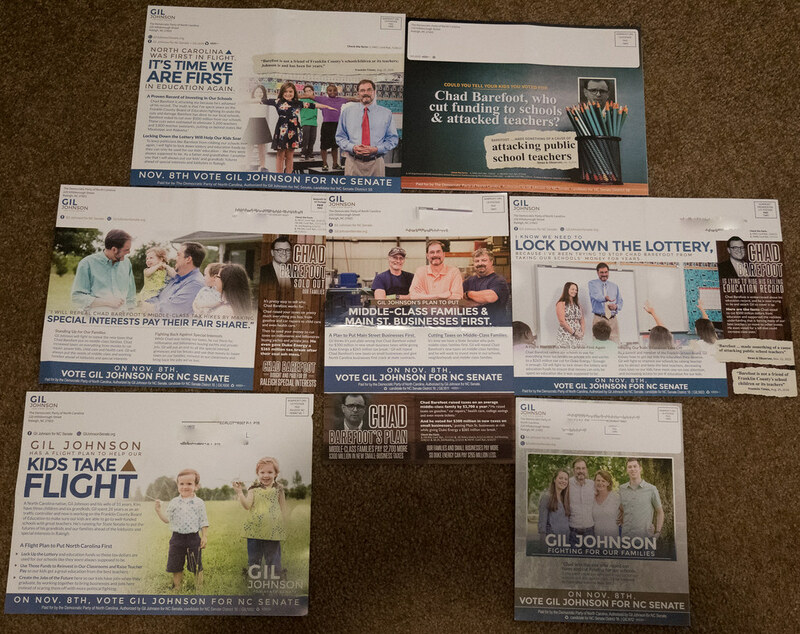 A few other ads I received for local elections, one David Williams. Another local election candidate Caroline Burnette. And finally local candidate Shelly Dickerson. 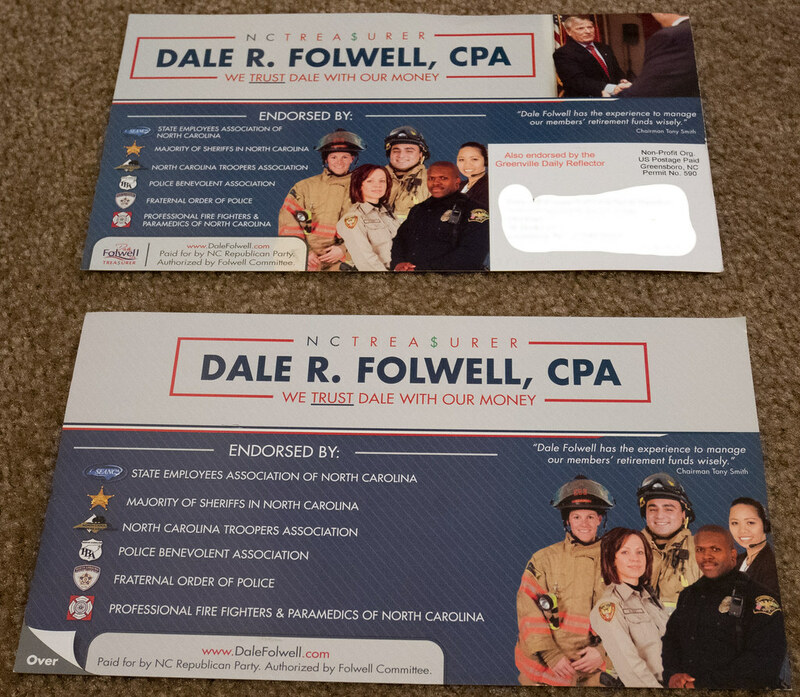 2 ads for North Carolina Treasurer candidate Dale Folwell, but no information from an opponent. 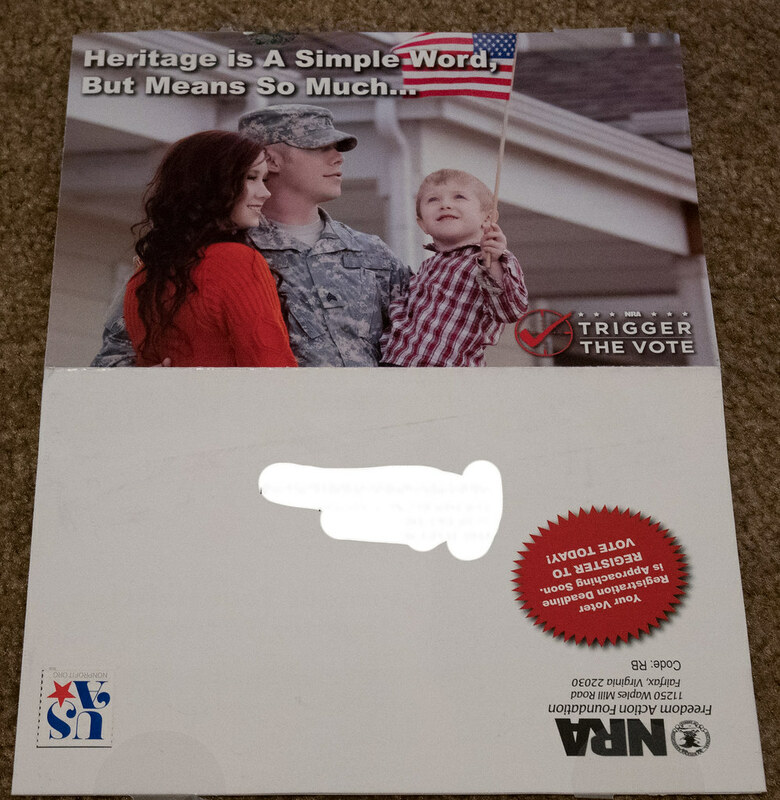 I received an ad from the NRA encouraging me to vote. 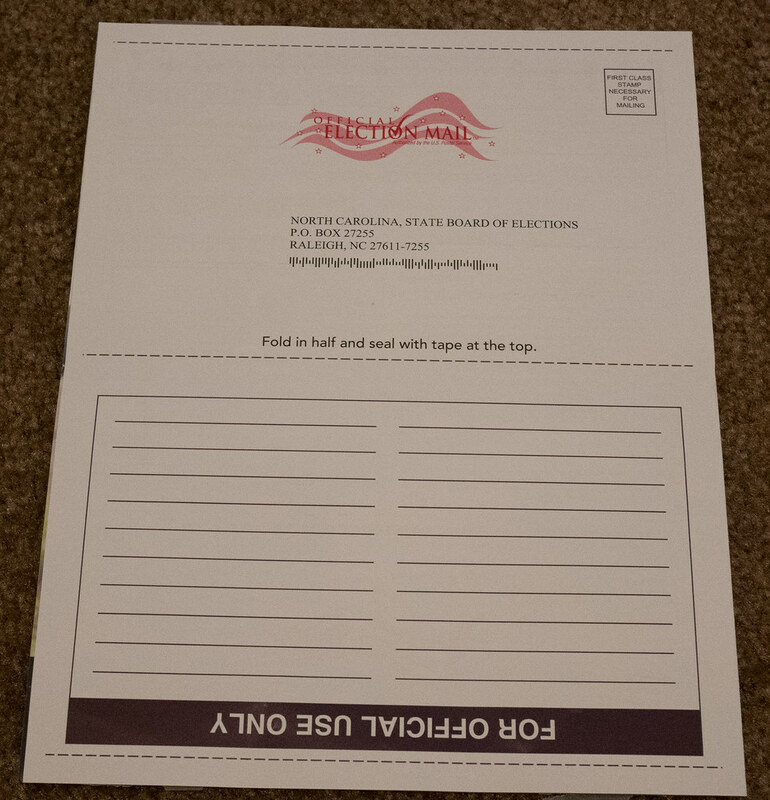 It does not endorse one candidate over the other, and even includes a handy voter registration form that I can fill out and mail in if I’m not registered. And finally, my favorite ad. This is a handy guide from the Faith & Freedom Coalition that lists the Presidential, U.S. Senate, Governor, and Lt. Governor races. 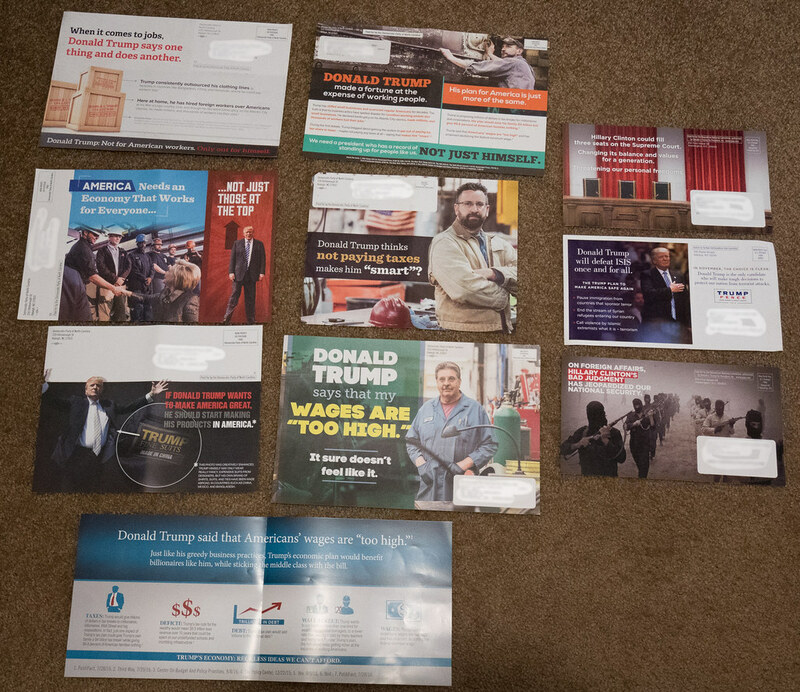 It lists each candidates stance on a few key issues. This ad does not endorse one candidate over the other other than stating their positions, and also giving their sources for the stance. 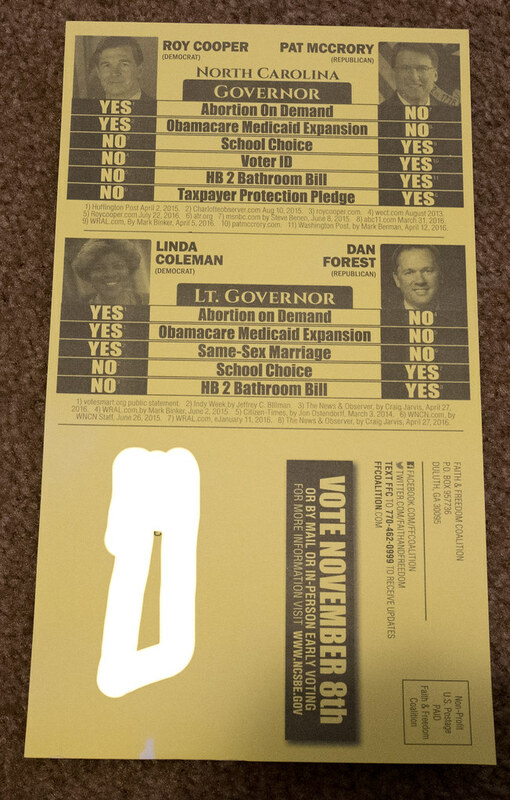 Of course these simple Yes vs No stances are more complicated in real life political voting, I enjoyed that it made an attempt to be impartial. If they were not being impartial and they clearly mean something in these selection of stances and issues, then the message was lost on me. This entry was posted on Tuesday, November 15th, 2016 at 10:47 pm	and is filed under General. You can follow any responses to this entry through the RSS 2.0 feed. You can leave a response, or trackback from your own site.